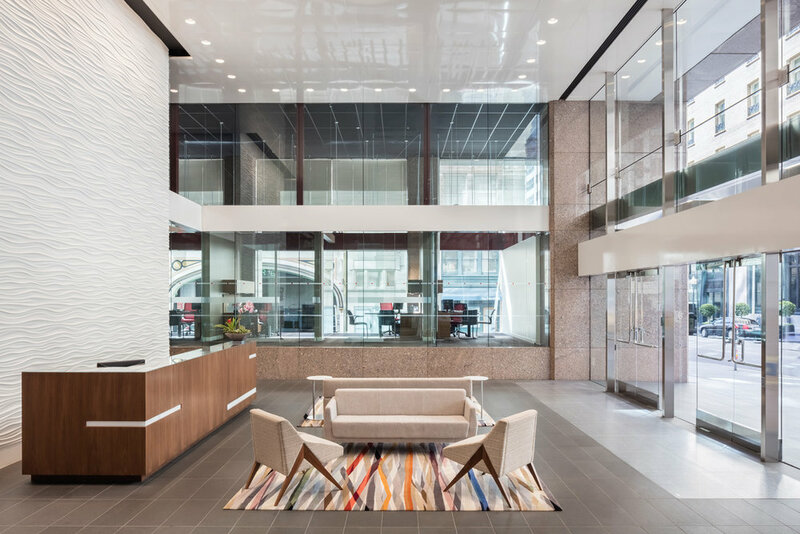 At 33 New Montgomery we performed a full interior and exterior lobby renovation, featuring a new stainless steel architectural canopy with the illuminated address incorporated into the facade. We worked alongside the architect and structural engineer during the preconstruction phase to design the canopy and determine a sound method of anchoring it to the structural, granite-clad columns. Working with the City of San Francisco, we removed a portion of the existing sidewalk and installed new granite pavers extending to the curb without interrupting the area's flow of heavy pedestrian traffic. Interior improvements included new architectural features, a wood plank ceiling and new absolute, black granite tile flooring throughout. We also relaminated the existing security reception desk without disturbing critical building operations.